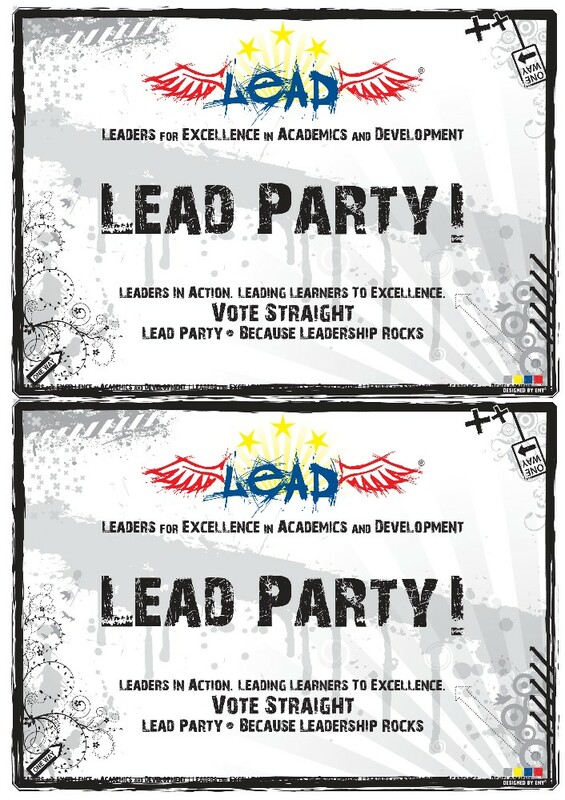 The Leaders for Excellence in Academics and Development (LEAD) Party is concern on the condition of education and student affairs in The Philippines School (TPS) through efficient leadership that would help young students excel in academics and develop their potential skills. LEAD Party supports a wide range of activities, providing school policy-relevant projects on basic concerns as diverse as: school politics, student discipline, academic organizations, literary and musical clubs, sports activities, public relations and charitable outreach programs. It is also our dream to be involved in extending recognitions to teachers and employees to strengthen student-faculty-administration relations. This Platform and Pledge will serve as our inspiration in our future thrust to the Supreme Student Council if given a chance to be in office. Sustaining school morale and pride. Fraud and dirty elections, in all its forms, must become a thing of the past. As an official political party in this educational institution, we, the LEAD Party is committed to ensure clean and honest election. We believe that clean elections begin and end with honest, well-trained teachers and student leaders. To ensure clean elections, our first priority must be working with school election officials to train students to become honest candidates and voters. This is the best legacy we can hand down to the next generations as future student leaders of TPS. We do not allow vote buying from its simplest disguise to obvious manifestation of any currency. It is our utmost dream to inculcate honesty and clean elections by endorsing candidates with good academic backgrounds and sincerity to serve and lead. We are the prime movers for an election with a heart by voting the right candidate based on merits and performance and not by the candidates’ pocket. As student leaders, it is very challenging to tackle school discipline. All we can honestly do is to share authority with the school officials and parents in imposing disciplinary rules. In our program, parents must be involved in all disciplinary actions. We believe that families are the origin of society, thus schools are tasked to back-up and increase the lessons acquired at home. To do this, we as student leaders will sincerely uphold existing education policies that focus on improving behaviors. We will also establish the best we can as best examples in TPS of an ideal Filipino citizen who is kind, respectful, honest, trustworthy and God-fearing individuals. We have our full support for teachers, who must be protected from false allegations of abuse. Current research (http://www.politics.co.uk/news/opinion-former-index/education/cameron-backs-teachers-over-school-discipline-$476693.htm) found 20 per cent of teachers have been falsely accused of abusing children. We will support appeal panels to settle disputes between parties in order to reach fair judgment. Student’s involvement to clubs and organizations is a good training ground for self discipline and teamwork. As they seek career in the future, companies seek students who have demonstrated involvement in activities outside the prescribed curriculum, along with academic achievement. To ensure that they will remain responsive to academic requirements, we propose that students must maintain an average grade of 85% in all subject areas in order to be part in club activities. possess extensive knowledge of anatomy, physiology, kinesiology, preventive medicine, exercise and conditioning, nutrition and sports psychology. In an effort to improve and increase the use of available resources and technical backgrounds of students and staff, LEAD Party dreams to develop ‘‘partnerships’’ with external organizations whose members are either interested in charitable programs or community services. With TPS Supreme Student Council (SSC) acting as a facilitator, these new collaborative relationships will provide an excellent means for expanding TPS service areas. By making use of existing SSC as communication channel in other external organizations, SSC will be able to make contact with potential clients. Collaborative charitable activities include: volunteerism, gift giving, free exhibits, environmental concerns, health and nutrition programs and participation to economic and cultural affairs. This can be done by providing information on TPS SSC programs and updates in school newsletters and online services; developing links to Web sites; providing training on social services and other activities; developing individual workshops for specific programs; and identifying and assessing the needs of the community. This two-way interaction with outside networks increases the utility of TPS SSC programs and services by more accurately reflecting the needs of various constituencies. Technically, this is termed as application of academic backgrounds in the real world situation. Upon the completion of the annual conference and reports, the Supreme Student Council 2008-2009 will establish recognition for teachers and employees for their sincere services and exceptional contribution in academics and educational services. This will be in recognition of the extraordinary efforts and time involved in the teaching, administrative and facilitative efforts. This awards and recognition for teachers and employees may also be presented to committee chairpersons who have done an outstanding job in carrying out the function of their committees. The individual nominating a committee chairperson for this award must submit in writing to the Awards Committee, the person’s name, the committee chaired and reasons this person should be so honored. The Awards Committee will submit to the Executive Board the name of the chairperson who is recommended along with supporting rationale. If we will be given a chance to hold an office in SSC, we will also present awards to outstanding members of the different organizations and clubs as well as their respective advisers. The criteria will be designed by selected SSC Officials. The LEAD Party envisioned that SSC will be an ideal body of active leaders in school. This is not a club, but the student government is an organization which represents the concerns of students and provides a liaison with the school’s administration. Senators and Representatives, elected from each advisory, meet regularly on agreed period to discuss issues and plan activities for the entire student body. The representatives report back to their advisories on upcoming events, and on the outcomes of the discussions. Senators and Representatives should be responsible, articulate and resourceful members of the student body who are willing and able to take the challenges of the organization. We will continue to advocate honesty and sincere service to the entire school populace with fortitude to impose rules and regulations in accordance to the norms and standards of the human society. With this will power to serve truthfully, the LEAD party will become a pride to TPS as the first political party of this institution to lead the pioneering student body. Culture is a way of life of the people. It is their socially induced beliefs and practices, values, and behaviour that have been the basis of how they live and communicate to others. There are many cultures that are already established; there are some that are on their way there; and there are a lot of sub cultures within the bigger picture. Some of the practices of one culture are generally the same with practices of the other but basically, they are separated by unique ways depending on how the community practice that certain culture. Generally there have been biased and racist effects of having certain standards of what a culture should be. However that was before and now, however exotic a practice is, it should be respected. Otherwise, a person is offensive by judging the culture different from his. There are accepted practices and there are unaccepted ones. There are ordinary traditions and there are what we call “taboo”, a practice that is considered sacred to a group but is weird to others. As a person who grew up with different cultures and traditions, I had a taste of life as how other people view it or spend it. I’ve experienced cultures that mould the personalities or identities of the groups of people who had spent their lives within that culture circle. But now I have a dilemma. If I’ve gone through different cultures and spent so much time on each of them, what am I supposed to be? What is my culture? Where do I really belong? What is my real identity? Could I choose, or will the society dictate for me? That is one thing I’ve been confused about all along. A “third-culture kid (TCLK)”-that’s what we’re called. It sounds like we’ve had three cultures that have moulded us, but no! According to an article in Wikipedia, “a third culture kid (TCK) is a person who has spent a significant part of [their] developmental years outside the parents’ culture. The TCK frequently builds relationships to all of the cultures, while not having full ownership in any. Although elements from each culture may be assimilated into the TCK’s life experience, the sense of belonging is in relationship to others of similar background”. Well, that figures. I’d love to discuss as many traditions I’ve experienced that are really different from how Filipinos live but I will just stick to a culture that is common not only in the Philippines and in the Middle East but also from around the globe, Ramadan. It is a common practice by the Muslim community. It’s counterpart in the Christian belief- as in my religion’s practices is Prayer and Fasting which occurs at a different time period. What do the Muslims do during Ramadan? In many Islamic countries, the beginning of Ramadan is announced by a firing of a gun or cannon on the eve of the first day (which begins at sunset not sunrise). Since Ramadan is the month of fasting, Muslims do not eat on daylight. They cannot eat nor drink- not until the sun goes down. The morning hours are usually spent reciting the Koran, while the rest of the day is spent sleeping, reading and praying. Then, as sunset approaches, Muslims gather in the mosque to chant the Koran and pray. According to a website called Fun Munch, “…when do you start to fast? The rule is that when it becomes light enough where you can tell a white thread from a black thread, the fast must begin. In the evening, when you can break the fast and eat, (known as Iftar) it is usually customary to begin with a white soup made of wheat broiled in meat broth. This is followed later by a regular dinner of meat, rice and vegetables. Iftar is a happy occasion and food is either prepared at home or purchased at a market. The timing of Iftar is usually announced on the radio or television today. But the old tradition is to listen for the call from the minarets of the mosque.” Fasting does not only relate in food but also things that people indulge like intoxicating beverages and sexual activities. When I first came to Dubai, UAE, I got culture shocked. The cultural practices and traditions are very different. I had a hard time coping up at first but I had fun learning how it is there. Just like in the Philippines, there are only two types of weather conditions (excluding the sandstorms, of course, for they come and go anytime of the year). The only difference is that the weather in UAE is more on extremes. In UAE, summer season is extremely hot; the winter season is very cold (snowing is very rare) and the temperatures reach up to -3°C but the average temperature is around 18-25°C. The Ramadan I’ve experienced elsewhere and in the Philippines is very different than what I’ve experienced in UAE. In the Philippines, the Ramadan is observed only by the Muslims (since this is a non-Muslim country). Muslims are not really concentrated in one area-except in Mindanao where almost ¾ of the population are Muslims. So, we, non-Muslims are not expected to follow their fasting but in general-are to respect their traditions and not ridicule and mock them. We also have announcements about Ramadan on TV and radios. It’s like Ramadan is already part of our culture. The holidays of the Muslims have become ours. It’s like were adapting to their culture as to proving to the Mindanao dwellers that they are part of our country too and that they don’t need to build their own government and form a new country. Maybe that’s how it is. In Dubai, we’re the ones who should abide by the traditions of the Muslim since it’s a pre-dominantly Muslim country. My first Ramadan experience there wasn’t that bad but I had a hard time. I was lectured about the rules and practices there with regards to Ramadan. Yes, I’ve learned a lot but it was really difficult for me to be forced to follow them immediately. I’ve tried to conform but I failed most times but after sometime it became a part of me that I was already used to it. First rule is that we have to wear decent clothes when going out so that the Muslims couldn’t be tempted. Second is that we cannot eat nor drink outside in public during the day that means a very offensive disrespect to the Muslims. Third is that we should observe their prayer times (really, we have to do that for 5 times a day!). Fourth is that we should not temp them in any way that will make them impure during the fasting period-actually even during the evening for it defeats the purpose of fasting. What I like most about the Ramadan experience in Dubai is that during the month of the celebration, our classes are only from 8am-12pm. We usually have to be home by 1pm so that the non-Muslims can eat. We are not really allowed to eat in school to give respect to those Muslims who are fasting-in implementing that, our canteens are literally closed. They only sell water. Though, it’s not that fun staying indoors either during the mall closing hours. However, there is already internet and television during our time, unlike in the past; they don’t have televisions or computers. What I also like in my Ramadan experience is that I get to try their culture and join in their festive Iftar mood. The festive food choices and the late night gatherings that is culturally special for them. I also like the holiday after Ramadan. The Eid Al Fitr (عيد الفطر) is a festive holiday which lasts up to 3 days without classes (if it falls on a weekday). There is not much change that happened really. It’s not the tradition that changed but how they celebrate it. The technology has affected the way they celebrate and announce. Before, it was only the mosques who announce on the hours of the “prayers, fasting and breaking the fast” now, even the media covers the events that is held on different parts of the country. Like during the opening and ending of the Ramadan with the firing of the cannons at some place, people don’t have to flock around the place, they can already watch it on the TV. But these changes didn’t happen overnight. The changes are very gradual, depending on the reliance of the tradition on technology and practicality is not even close. Muslims spends a lot for the post Ramadan festivities to mark the end of the fasting season. I chose this practice because I’ve been stricken at heart about the real meaning of this practice. I’ve lived in the Middle East for quite some time and I was drawn to its vast culture and unique traditions. The meaning of the fast is not to show in physicality that they are religious and always obedient-like hypocrites but to cleanse ones’ self and to do penance for their sins and mistakes. They do not have to tell a person -like a mediator- all their sins but they direct it to Allah in fasting. Unlike the Catholics who still practice Acts of Contrition, Muslims believed that it is more personal to tell God directly of their wrong doings rather than having a mediator do it for them. Which I believe so too-that it is better to talk to God directly. Anonymous’, , ed. “Ramadan.” Wikipedia. Wikipedia, 2011. Web. 7 Dec 2011. <http://en.wikipedia.org/wiki/Ramadan&gt;. Anonymous’ , ed. “The History of Ramadan.” The Holiday Spot. N.p., 2010. Web. 7 Dec 2011. <http://www.theholidayspot.com/ramadan/history_of_ramadan.htm&gt;. Anonymous, . “History.” Fun Munch. N.p., 21 Aug 2009. Web. 7 Dec 2011. <http://ramadan.funmunch.com/ramadan-history.html&gt;. Anonymous, . “Customs and traditions.” Fun Munch. N.p., 21 Aug 2009. Web. 7 Dec 2011. http://ramadan.funmunch.com/ramadan-traditions.html.